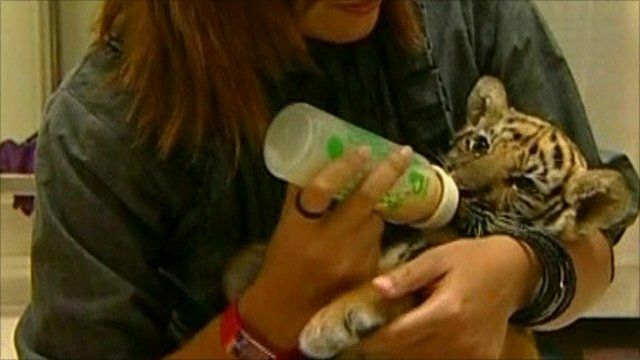 Tiger recovers after luggage ordeal Jump to media player A two-month-old tiger cub found sedated and hidden among stuffed toy tigers in luggage at Bangkok airport has been sent to a wildlife conservation centre. 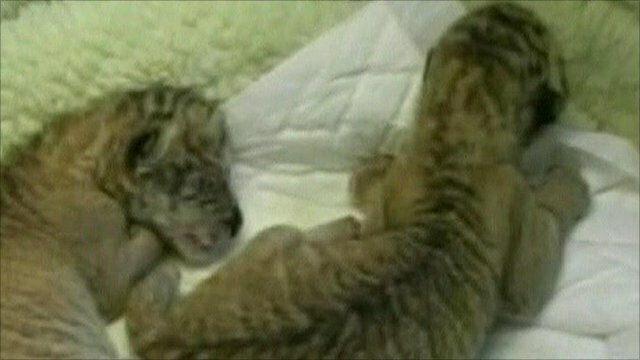 Collector fined for breeding 'ligers' Jump to media player A wild animal collector is facing fines for crossbreeding a lion with a tiger. A two-month-old tiger cub found sedated and hidden among stuffed toy tigers in a woman's luggage at Bangkok's airport has been sent to a wildlife conservation centre. Authorities discovered the cub after the woman, a Thai national, checked in and her bag was sent for a routine x-ray because it was overweight. A toy tiger was also placed in the suitcase in an apparent ploy to fool any inspection.